Lippings and veneering open up many exciting areas of woodworking that many people never venture into. Hopefully this article will help those into having a go at techniques that will push the boundaries of their making. Lippings are used to cover up an unattractive substrate which could be of MDF, ply or solid wood of a different species. 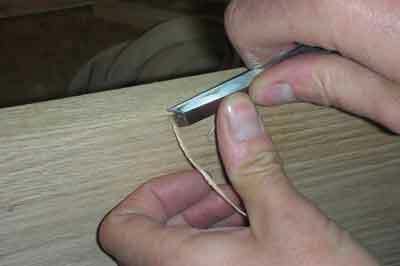 For strength lippings or wood edging will rely on glue surface and face veneers overlapping them. On solid lippings the glue surface can be increased if we make a tongue and groove joint as this will increase glue area and ultimately strength. A false tongue will also do the same job, and 6mm MDF or ply is ideal with a 6.5mm groove cut with either a router or a spindle moulder. This allows a little lateral adjustment and room for glue. These extra strengthening aids are needed if you are lipping onto plywood because ply is constructed of oppositely laid laminates so you only have half the sufficient glue surface. End grain does not glue well. 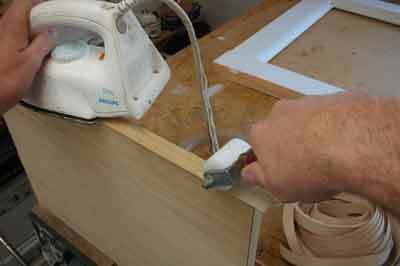 Secondly, on plywood the laminates can creep, resulting in the lipping being forced off the glue surface. This is particularly a problem with thin veneer lippings, so I avoid choosing ply as a substrate if this type of lipping is going to be used. 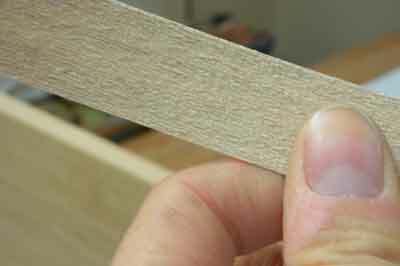 Used heavily in kitchen manufacture, the invention of pre-glued thermo-setting edging changed the way lippings were applied and this has been detrimental to the image the public has of veneered work because over time this technique usually fails and the lipping gets caught and falls off. Care must be taken when applying it and this product is reserved for the lower-end market. Easy to apply and ideal for the amateur with limited equipment, it comes in a roll with thermo-setting glue already applied to the back. 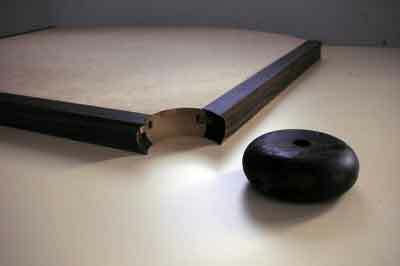 A domestic iron and decorating roller is used to apply it, but care must be taken to ensure a sufficient bond. 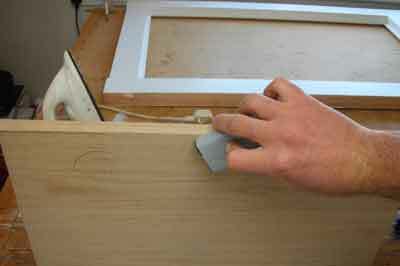 After pressing with the roller, run the back of your fingernails over the veneer and listen for any loose areas. Also, a light spray of water will lift any unstuck areas that can then be ironed and rolled again. 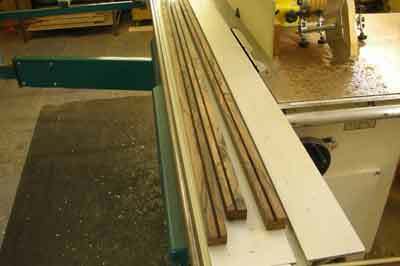 The change of moisture content in the veneer will cause any unstuck areas to bubble. This can happen a few days after applying the veneer as the iron will dry it out. It will then expand when it tries to find equilibrium with the air. Trimming the excess of this sort of edging is a bit of a nightmare. 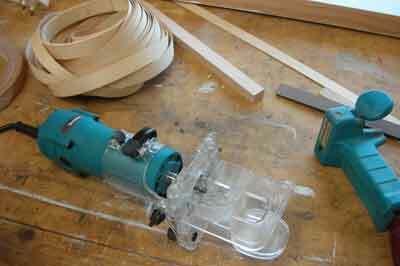 You could use a veneer saw, chisel, hand-held double edge trimmer, block plane, laminate trimmer or router. In my experience the veneer saw is slow but gives a good finish as it is not guided by the grain direction which is the problem with chisels and the hand-held trimmer. 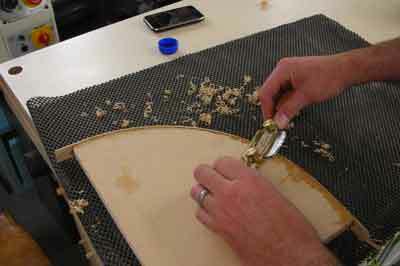 These techniques will follow the grain and ultimately rip edges from the substrate. Hand-held trimmers work better if you sharpen the back of the blade and separate it into two pieces. Use it on one side at a time and read the grain direction carefully for a satisfactory result. The block plane has a tendency to fold over the veneer instead of cutting, but works very well when the edging is 1mm or wider. My favoured technique is using a laminate trimmer. 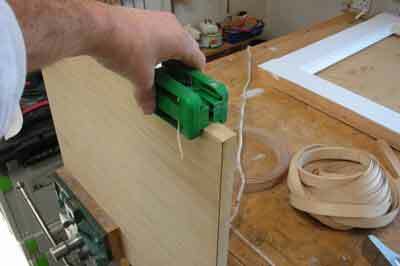 With a little bit of setting up you can trim off veneered and wider solid edging with accuracy and speed. 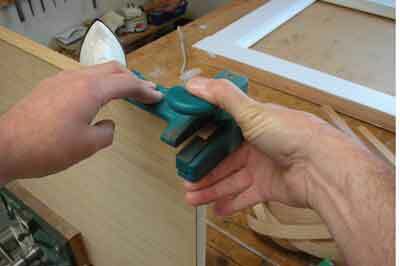 Solid wood edging is reserved for a higher price bracket because it needs more work and skill. A much more superior finish can be achieved from it and it lends itself to greater creativity with applications. In the past all edging would be solid wood. 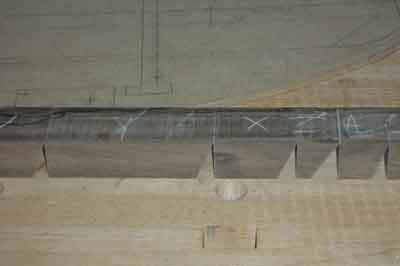 The best work would always have a tongue machined in the solid and a groove machined into the substrate. 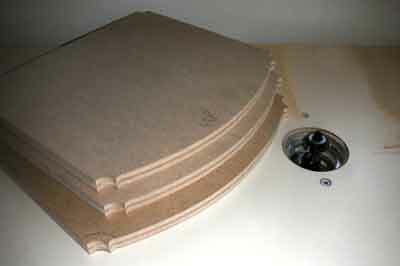 If the substrate is MDF and resin glue is used then the tongue can be eliminated. This can be a scary proposition but in my experience this is a positive technique. It is possible to use solid timber to go around curves with the grain pattern running uninterrupted. Usually steam bending or laminating are needed to bend around a curve but this technique means we do not have to resort to those techniques. 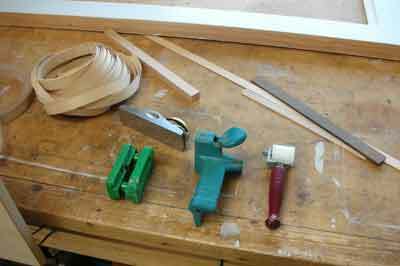 Instead the lipping can be cut out of one length of timber, mitre cuts made through the lipping, the mitres glued and the joints taped. 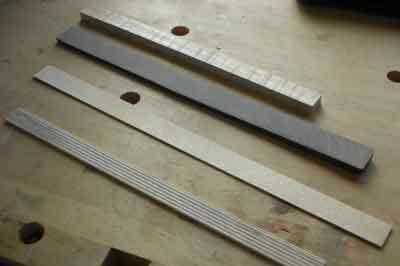 The lipping can then be shaped to fit the curve and applied to the substrate using a loose tongue. When the solid lipping has been glued on then the outside shape can be machined to final dimension. I have made lippings out of plywood and solid-wood end grain. Care has to be taken with this sort of lipping and the choice of glue is very important - epoxy is about the best for gluing end-grain timber. As mentioned above, trimming off the excess with a block plane works well but is slow. Working the plane out from the middle will ensure the lipping is flat to the substrate and not tapering off. 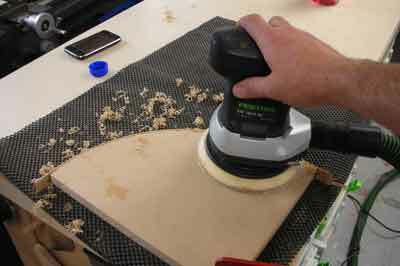 Other methods for trimming include use of a laminate trimmer, router and disc sander. 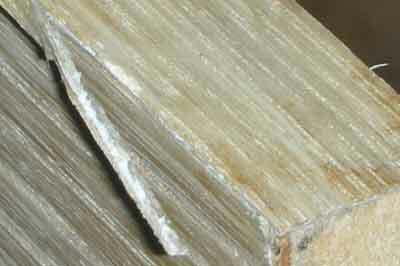 If, as is usually the case, you are to veneer over solid lippings, they need to be no more than 4-5mm wide. 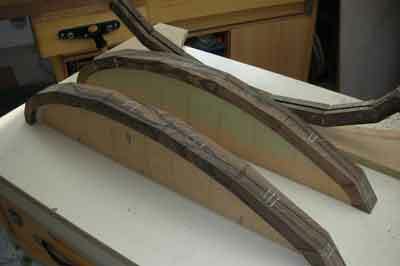 Any wider and they will eventually show through the veneer, known as telegraphing. 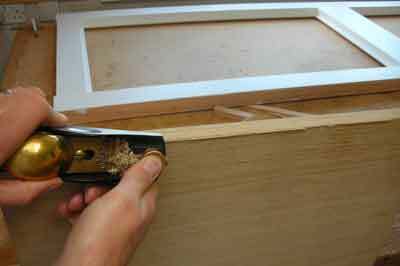 The lippings do not have to be straight and I have used these techniques many times on curved doors.